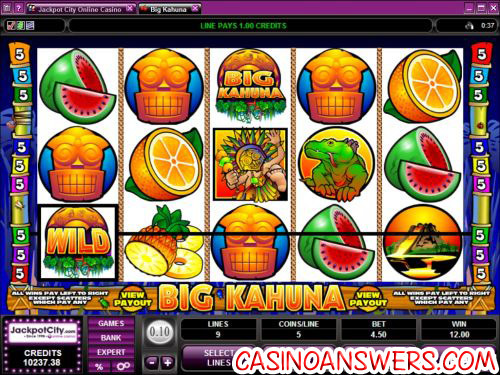 Big Kahuna Video Slot Guide & Review - Casino Answers! Big Kahuna is a 5-reel, 9-line video slot from Microgaming with scatter wins, wild substitutes and two bonus games. You can play Big Kahuna at 777 Dragon Casino and Lucky Nugget Casino. To play the Big Kahuna slot machine, you will want to place a bet first. First, start with the coin value. Available coin values are $0.05, $0.10, $0.20, $0.25, $0.50, $1 and $2. Next, select how many paylines you wish to play using the “Select Lines” button. You can play up to 9 paylines. Finally, select how many coins you wish to bet per line (up to 5). The minimum bet is $0.05 per spin. The maximum bet on Big Kahuna is $90 per spin. To bet all 9 lines and 5 coins per line, hit the “Bet Max” button. To spin the reels with the settings you have set, hit the “Spin” button. To win Big Kahuna’s 8000X top jackpot, five Big Kahuna symbols must appear on an active payline. The Big Kahuna symbol is also the wild symbol. It will complete any fruit winning combination only. Big Kahuna’s scattered monkey symbol only requires two symbols anywhere on the reels to win. All winnings from scatter symbols will be multiplied by the total credits staked. Scatter wins will be added to payline wins. One of Big Kahuna’s two bonus games is the Mask bonus game. To trigger this bonus game, you need three or more Mask bonus symbols. In the Mask bonus game, you must choose one of ten masks. Each mask will have its own prize hidden behind it. If you trigger the bonus game with three Mask bonus symbols, you can win from 14 to 1650X your bet. If you get four Mask symbols, you can win up to 2900X your bet. If you trigger the Mask bonus game with all five Mask bonus symbols, you can win up to 4375X your bet. Hit the “Expert” button on the Big Kahuna slot and you will switch the game into Expert mode. In Expert mode, you can utilize Big Kahuna’s autoplay feature. You can activate the autoplay feature in two ways – either hit the 5X or 10X button for quick autoplay spins or you can hit the “Autoplay” button to use its advanced features. Advanced features include number of spins (from 5 to 500), number of seconds between spins (0.25 to 1.5 seconds), to stop once all spins have been completed, to stop when jackpot is won, to stop if a win exceeds or equals (from $25 to $2500), to stop on any win, to stop when a bonus feature is triggered and to stop if your credits increase or decrease by (from $25 to $2500). Big Kahuna’s autoplay feature gives you pretty much all of the possible options you might need, with the exception of being able to input your own values. With two bonus games and a 8000 coin top fixed jackpot, it’s no wonder Big Kahuna is one of the most popular of all of the Microgaming video slots (and if you’ve seen Microgaming’s game library, you will know that’s not small praise). If you want to try the Big Kahuna video slot with $777 in free bets with no deposit required, please visit and sign up at 777 Dragon Casino! Where can US players find the Big Kahuna slot machine? Unfortunately, US players are not able to play at Microgaming casinos at this time. We recommend you try some of the fun and exciting iSlots at Vegas Days Casino. Does Big Kahuna have any special features? Absolutely! Big Kahuna not only has a bonus game, it has two! The bonus games are triggered by the Mask and Volcano bonus symbols respectively. 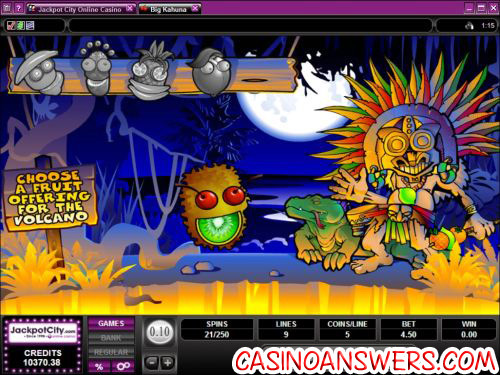 You can win up to 2500 coins in the Volcano bonus game and up to 4375 coins in the Mask bonus game. Both of Big Kahuna’s bonus games are very straightforward and easy to play. Do I need to download any software to play the Big Kahuna video slot? 777 Dragon Casino offers a no-download Flash casino in addition to the download version. If you have any problems playing the Big Kahuna Flash game in your browser, make sure you have the latest version of Adobe Flash Player installed on your computer. How do I win at the Big Kahuna video slot?